So, it probably isn’t surprising that when it comes to pudding, I love to reach for a nice chocolaty one. I swear I am about 50% chocolate and I do not apologize for that! Most of the time, I don’t really go for pudding, but it’s been on my mind a lot lately, and since I spent a few weeks without an oven, it seemed like the perfect time to make some. I wanted to make an easy chocolate pudding, but I didn’t want the stuff out of the box. So, I tried to make this process as simple as humanly possible. The process might be a bit different than what most people do, but that is truly because I wanted to make sure it was as easy as possible. This is meant for those late nights when you want to make something sweet, but are just lazy enough that you don’t want to fuss about too much. 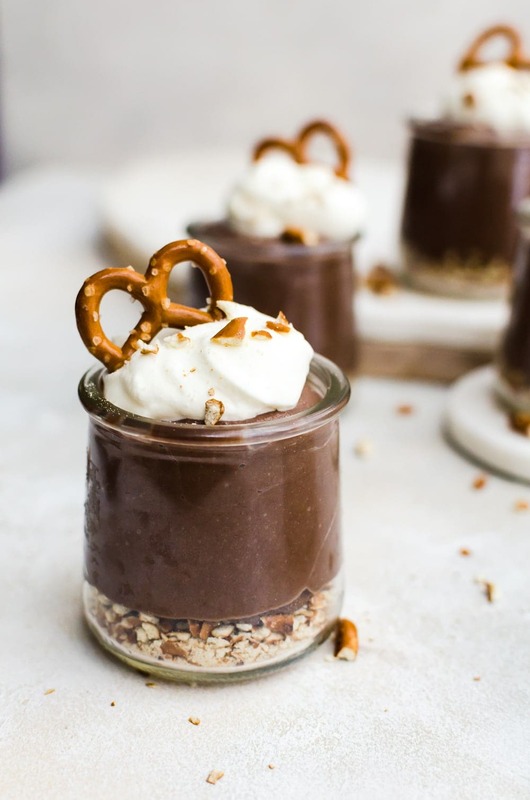 What makes this easy chocolate pudding recipe so much better than many of the others out there is that we don’t need to temper the eggs in this recipe. Instead, we whisk the eggs well with the milk until it is fully incorporated. Then we very slowly bring up the heat while we continuously whisk the homemade chocolate pudding. As long as you don’t blast the saucepan on high heat or skip the whisking, you won’t have any issues with the pudding becoming grainy.